Craig Martin: I find myself to be a creature of habit when it comes to the spaces in which I do work: I write on my couch at home, read on the back porch, grade papers in the dining room, write lectures in my office, etc. Usually, once I’m in that space I habitually turn toward the task at hand. Unfortunately, this can also be debilitating, e.g., when one needs to work in another space. I can’t write worth a damn unless I’m on my living room couch; that’s a problem when I need to write but I’m not at home. Ryan Fics: I have found color coding to be a beneficial tool for organization. For example, I designate particular colors for certain ideas and tasks when taking notes. Each color not only acts as a reminder, or a kind of memory trace that you can follow through your own notes (for example, making notes in green pen which correlate to a section in a book you have underlined in green), but also I find it is helpful for maintaining a codification system. Sticking to a color code system so that I do not mix what was written in green with what was written in red, blue, or black, helps me navigate through my own notes quickly when needed. On days when I find it hard to write, I find this system to be effective because while reading if I come across something important, it forces me to get a certain color of pen and begin taking notes which can lead to a short blurb, or section where I hash out a sketch of a rough idea. I’ve also found that if performed digitally, keeping colors in line with what they are used for in terms of different interests and ideas (especially in PDF) allows for a certain kind of repetition to take place. You can have several versions of the same document, with different color code schemes that represent different research projects/ideas. I have found that color coding documents on my computer can help unfold connections between texts and my own writing that I would not normally make, in a variety of ways. Happy studies and organizing! Donovan Schaefer: Getting to a point where I was regularly in the habit of writing everything down and also had an efficient “filing system” for organizing those notes was key for me. An idea that seems blazingly obvious to you while you’re sitting on a train or washing dishes or lying awake at 2 AM may be totally gone 6 hours later. And the memory of something you’re reading today that you suddenly realize could be foundational to your next project may be faded by the time you turn your attention to that work. Capturing the little points of contact I map out during the day and then collecting them in centralized locations–I have one big file internally divided by various upcoming projects that I add a few lines to every other day–not only helped me work more efficiently, it highlighted for me how writing is always a sedimentation of different strands of thought and research spanning my academic and non-academic lives. Travis Cooper: Since a large portion of my research is “digitally ethnographic,” as it concerns blog posts, news articles, church facebook pages and discussion forums, online book reviews, etc., the simple webpage bookmarking function, via Internet Explorer, works wonders. One can title bookmarks appropriately and then manage and organize them using topical folders and search options. For broader research, though, I’m finding new software programs such as NVivo productive. One can store any and all information in the program–websites, book and article bibliographic information, article PDFs, and so on–and then highlight and code information on said artifacts through a complex and interconnected node system. NVivo is expensive but quite impressive in its information organization skills and cataloguing abilities. It also keeps all of one’s information for multiple, ongoing projects, all in one place. Kenneth MacKendrick: Most of us are under the impression that we can’t get anything done unless we have gigantic blocks of time, at least a good four hours or so just to get things started. This is an illusion. With some foresight and a bit of planning, you can get a lot done in 15 minutes. Putting yourself on a timer to respond to emails or write lectures or structure a short piece of writing can save a lot of time. 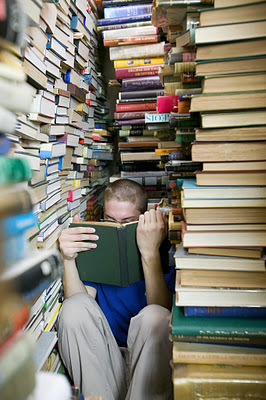 This isn’t a useful strategy, in fact it’s a pain in the head most of the time: I make all my notes for writing in the margins of the books or articles I’m thinking of using for a given project… which means that I when I go to write I essentially need to surround myself in stacks of books. Sarah Rollens: Someone once told me that she couldn’t start writing until she’d done all of her research. For me personally, I have no idea what “being done” with my research looks like, so I’ve tried to cultivate the habit of writing—even if it’s just a paragraph or something short—as I read, even if I’m not sure how it will fit into a larger project. It’s easier for me to edit or excise later on, but far more difficult to generate thoughts based on things I’ve read months ago. Also I’ve found that the most useful way to go about my research is to learn to recognize my own habits. Some days I write a lot; some days I write nothing. On the days where I write very little, I try to shift my attention elsewhere: translating tasks, bibliographical entries, catching up on reading some articles, etc. When I was working on my dissertation, I had a few spells where I tried to achieve 1000 words per day. That was reasonably successful since my writing style is to over-generate content and then edit for quality. This entry was posted in Craig Martin, Donovan Schaefer, Kenneth G. MacKendrick, Uncategorized and tagged NVivo, Ryan Fics, Sarah Rollens. Bookmark the permalink.